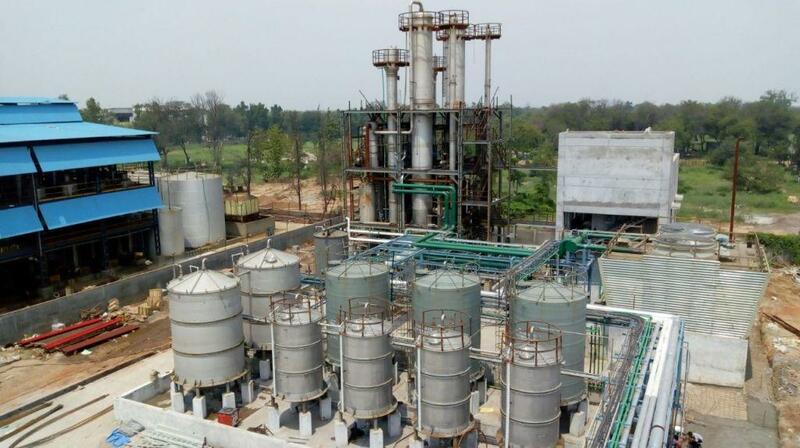 The Dilute acetic acid cannot be purified by conventional distillation methods. Hence, extractive distillation is employed to distill dilute acetic acid. Dilute acetic acid is fed from top to the extraction column and the solvent ethyl acetate is fed to the column from bottom. Solvent acid coming form top of the column is sent to a distillation column where pure acetic acid is 9d as a bottom product. The top product of the column after condensation is sent to a decanter. Top over from the decanter is partly sent to the column as reflux and partly to the extraction column through an intermediate tank. The raffinate i.e. bottom product of the extraction column and the bottom over flow of decanter -1 are mixed and sent to a recovery column to recover the solvent i.e. ethyl acetate. The top product of the recovery column is sent to a decanter II after condensation. The top over flow from the decanter is partly given as reflux and partly withdrawn as recovered solvent which in turn is sent to extraction column through intermediate tank. The bottom of the recovery column is sent to drain along with the bottom of the decanter – II.